Erub, also known as Darnley Island, is situated in the eastern island group of Torres Strait approximately 180 kilometres from the tip of the mainland, 60km south of Papua New Guinea, and is home to around 300 people. “This is an important moment for the Erub community who can now make and receive mobile calls and access high speed mobile broadband through Telstra’s 3G and 4GX services,” said Rachel Cliffe, Telstra Area General Manager. “The remoteness of the site made delivering coverage to the community equally challenging and rewarding. Crews and equipment had to be either flown in or arrive by boat, whilst battling monsoonal rain, but the state of the art connectivity that is now being delivered to the island is bringing many benefits. As well as being able to make calls and access fast wireless data, this project importantly opens up digital doors to education, health and business opportunities to benefit some of Australia’s most remote communities,” added Ms Cliffe. Telstra now has 450 mobile base stations and nearly 200 4G small cells online, expanding mobile coverage to regional communities across Australia by more than 160,000 sq. km. “So far, more than 60 million calls have been made and more than 2,500 terabytes of data have been downloaded thanks to these new base stations, showing how important connectivity is to regional and remote communities,” said Ms Cliffe. 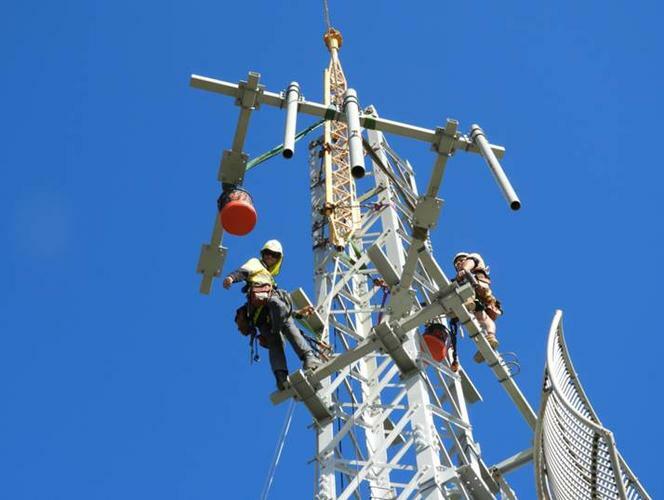 Construction of the Darnley Island mobile base station involved co-investment between Telstra, the Federal and Queensland Governments, and Torres Strait Island Regional Council. “The Coalition Government has invested heavily in the Mobile Black Sport Program to ensure that regional Australians have access to 21st century communication technology,” said Regional Communications Minister Bridget McKenzie.